Respondents were asked their beliefs about gambling abuse as part of a general population telephone survey. The random digit dialing survey consisted of 8,467 interviews of adults, 18 years and older, from Ontario, Canada (45% male; mean age = 46.2). The predominant conception of gambling abuse was that of an addiction, similar to drug addiction. More than half of respondents reported that treatment was necessary and almost three-quarters of respondents felt that problem gamblers would have to give up gambling completely in order to overcome their gambling problem. Problem gamblers (past or current) were less likely than non- or social gamblers to believe that treatment was needed, and current problem gamblers were least likely to believe that abstinence was required, as compared to all other respondents. 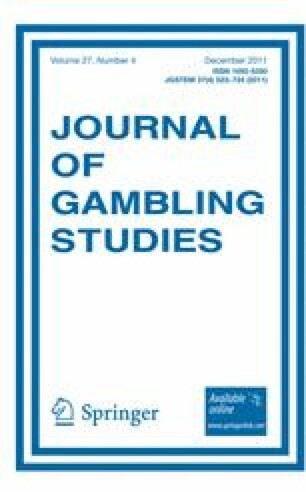 Strong agreement with conceptions of gambling abuse as disease or addiction were positively associated with belief that treatment is needed, while strong agreement with conceptions of disease or wrongdoing were positively associated with belief that abstinence is required. This research was supported by the Ontario Problem Gambling Research Centre. In addition, support to CAMH for salary of scientists and infrastructure has been provided by the Ontario Ministry of Health and Long Term Care. The views expressed here do not necessarily reflect those of the Ministry of Health and Long Term Care. John Cunningham is also supported as the Canada Research Chair on Brief Interventions for Addictive Behaviours. Cunningham, J. A., Hodgins D. C., Toneatto T., & Cordingley J. (2006). Barriers to treatment for problem gambling in Ontario. Ontario problem gambling research centre: http://www.gamblingresearch.org/contentdetail.sz?cid=3097&pageid=1873&r=s.